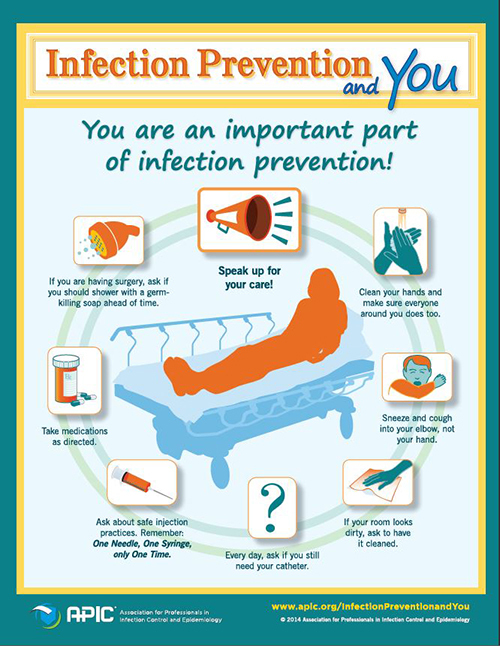 This week, October 15-21, is International Infection Prevention Week. It is worldwide in scope, celebrated the third week in October every year. There is a lot of very useful information for both healthcare professionals and for patients, families and just everyone, compiled and offered for distribution on a website operated by the Association for Professionals in Infection Control and Epidemiology (APIC). This site is chock-full of information! You'd be surprised, many of the concepts are surprisingly simple and doable by virtually everyone. This year's theme is Antibiotic Resistance. It may not sound exciting, but it is quite important as an issue, with the increasing ability of bacteria to mutate and become impervious to various antibiotic medications. The first, simplest, and most basic thing you can do to prevent infection in the first place is to wash your hands. There is more you can do! Thanks to the APIC, there is a wonderful infographic that explains why this can make such a difference in health. The infographic below is by the Association for Professionals in Infection Control, and it is one of many very useful and helpful infographics available on their website for your use and to share with others. Speak up for your care. Ask about safe injection practices. Keep your room clean (or ask to have it cleaned). Ask questions about your medications. If you are scheduled for surgery, ask if you should shower before the surgery. If you use one, ask if you need a catheter, each day. Ask about vaccinations so you can stay healthy. Get to know an infection preventionist. Educate yourself about healthcare associated infections. There is a lot more information in that website on many related topics. Be sure and visit, and share the information you find to your friends and family through your social media networks. It's Flu Season - Protect Yourself!